Winter Fury is on its way!! If you follow my blog, you know that earlier this week I took a mini-vacation to celebrate my anniversary! I had a great time and on the drive home, I started playing around with my yarn. (I know….I know….but I can’t help it.) Here’s what I came up with so far. I hope to have all the tweaking completed by the end of the weekend so that my wonderful testers can get busy. What do you think? The hat is super warm because of the texture. Some of the stitching causes layering and it would be perfect for the person living in a cold climate. 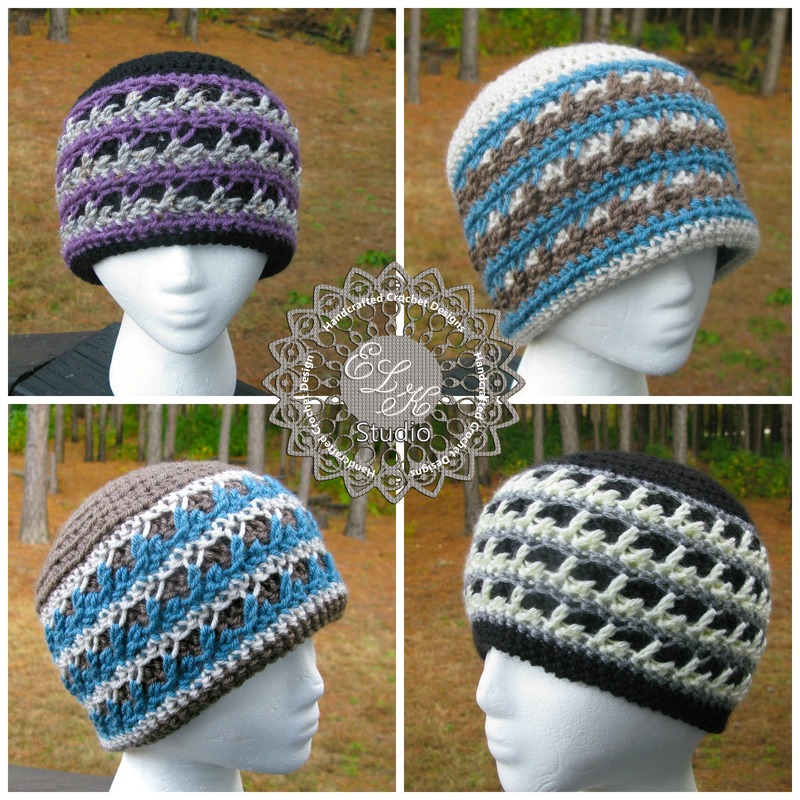 I have tried out different stitches of yarn to get the perfect pattern for you! If you have a favorite, please let me know by leaving me a comment along with your number that is above or below each picture. Be sure to look out for the release of the pattern by following me on my blog, or you could join me over at ELK Studio’s Facebook page! I love this pattern! I’m hoping to make it as a Christmas gift, will it be available in time? Happiness!!! Thanks so much, I hope you had a great Thanksgiving. I like #4. Because it really does remind me of a snow storm. #3 but I’m not sure if that’s just because I like that color combo the best. They are all great! all of them:)) i just made my first pair of boot cuffs from one of your patterns…you are an amazing designer!! thank you for sharing your talent with us!! Awww! So glad you enjoyed the pattern. Thanks for your input! I know Becky. I tried several times to get them to line up and just gave up. Thanks for the input. They are all great – liking #3 and #4 the most – maybe the color combinations are swaying me. Thanks Kathryn. I love those also! My favorite is still #3! Love the design. I like Number 1 and 4. It’s lovely. I like 2 and 3 best. All these are amazing! I love your designs! They are all great. I would have to say do patterns for all of them.